Enjoy unique art workshops while learning more about Peranakan culture. Whether you're a beginner and experienced crafter, immerse yourself in the relaxing process of designing and creating your own fabric prints. Australian-Singaporean artist Jennifer Lim guides you in a supported learning journey in the heart of Singapore. Public Workshops are usually offered on a regular basis. Private Workshops enable solo crafters, couples and groups of friends to select a date of their choice. Perhaps another time? Join my mailing list for exclusive offers and updates. Be inspired by gorgeous shophouse tiles found around Singapore! 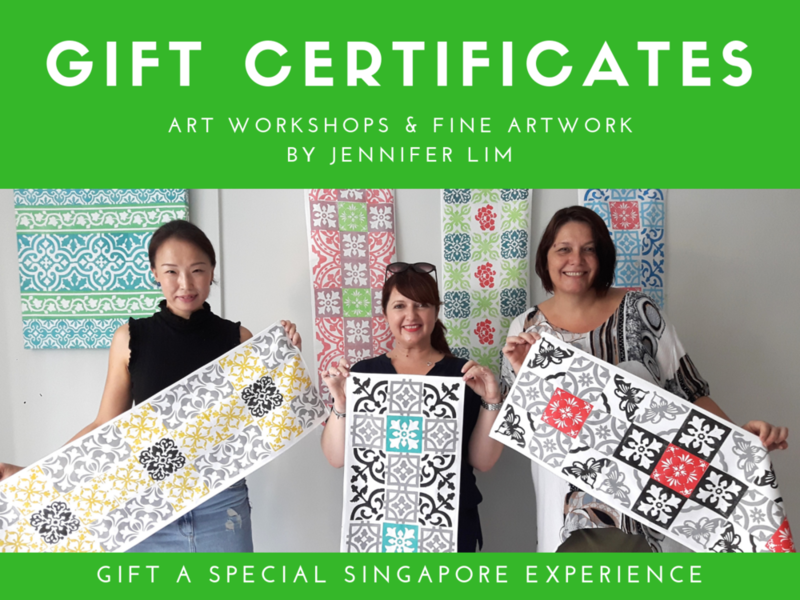 Create your own Peranakan tile inspired fabric artwork in a bite-sized workshop perfect for beginners and experienced creatives. Create an original rubber block and produce your own hand-printed fabric! In around 4 hours, you’ll be able to design, transfer your image and carve an original rubber block before hand-printing on fabric. Use your own design, or be inspired by my heritage Peranakan tile range! Original art prints are available for delivery in Australia and Singapore and can be found in our Singapore Heritage Tile Collection. A gift certificate can be created for you by contacting us. I was interested in Jennifer’s connections to Peranakan culture and the Peranakan influence in her artwork. The practical element of her workshop was appealing for our students. The workshop was very well resourced and I like the way that all materials were organised and laid out prior to the workshop. Jennifer had a calm and clear manner with the students who took part in the workshop.